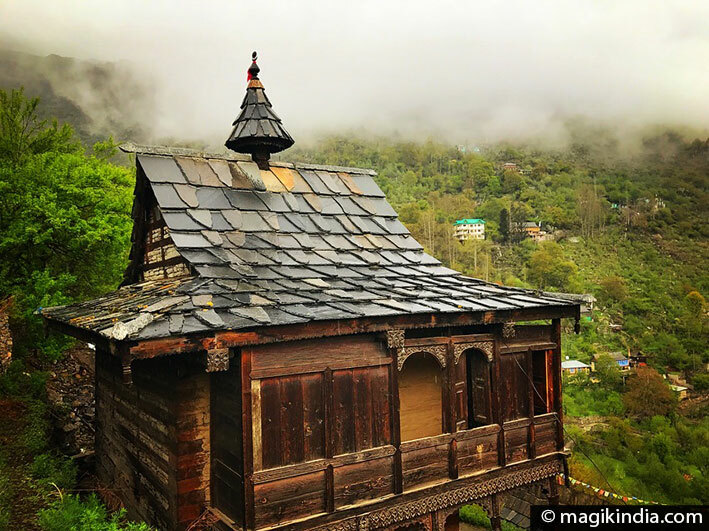 Kinnaur is like a precious and rare little treasure consisting of majestic mountain ranges, orchards, undulating hills and verdant valleys, temples-towers and picturesque hamlets with glittering slate tiles. The valley is lying in the south eastern corner of Himachal Pradesh and borders Tibet to the east. Trekkers and lovers of untouched landscapes will find there a green paradise. Historians believe that Kinnaur and some surrounding regions were part of the kingdom of Magadha and the Mauryas in the 6th century. After the collapse of the Maurya empire, the Kushanas and the Guptas took over. At the beginning of the 14th century, the Kinnaur region was divided into seven parts, locally called ‘sat khund’, constantly in conflict. The forts of labrang, Morang and Kamru (see below) tell us a lot about this stormy time of history. 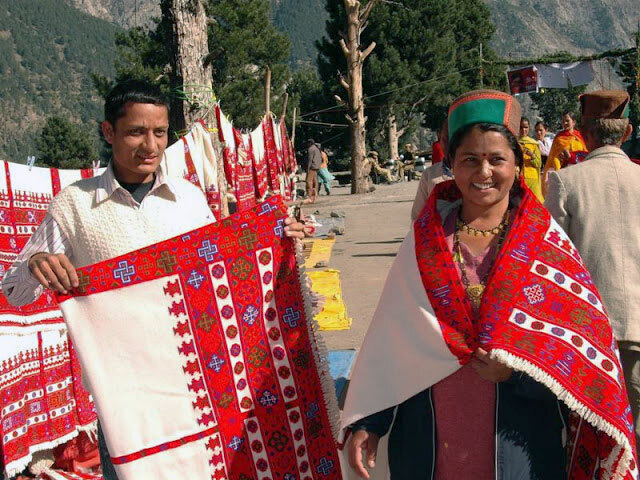 In recent history, Kinnaur was part of the princely state of Bushahr. It is believed that the Bushahr was founded at the beginning of the 15th century by Danbar Singh, a Rajput from the Deccan. In 1850, the British Raj initiated the Indo-Tibetan trade route that open new commercial perspectives. The creation of the state of Himachal Pradesh in 1972 and the inner-line permits for the areas close to the Tibet border gradually opened Kinnaur to visitors eager to discover the beauty of Himalayas. The proximity of the Tibet border has encouraged exchanges and the mixing of cultures. 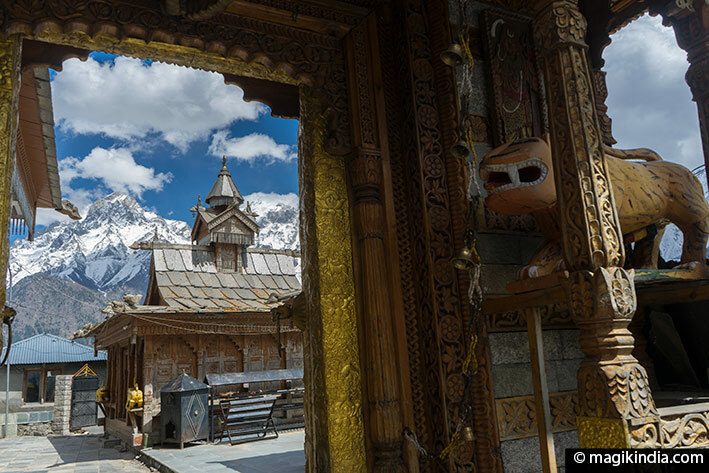 The influence of Buddhism is felt throughout Kinnaur, especially in architecture with pagoda roofs but also in the food, the costumes and religion; some villages and temples of Kinnaur marry Hinduism and Buddhism in one same place. 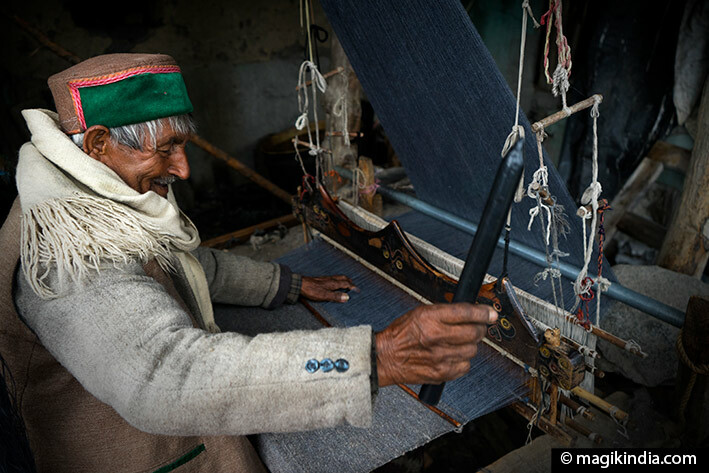 Woolen weaving is one of the most famous crafts in Kinnaur such as colored shawls with geometric patterns and the famous wool caps (Thepank), with the green velvet edge, worn by both men and women. This region is also reputed for its orchards (apples, apricots) and dried fruits as well as for its ‘chilgozas’ (pine nuts). 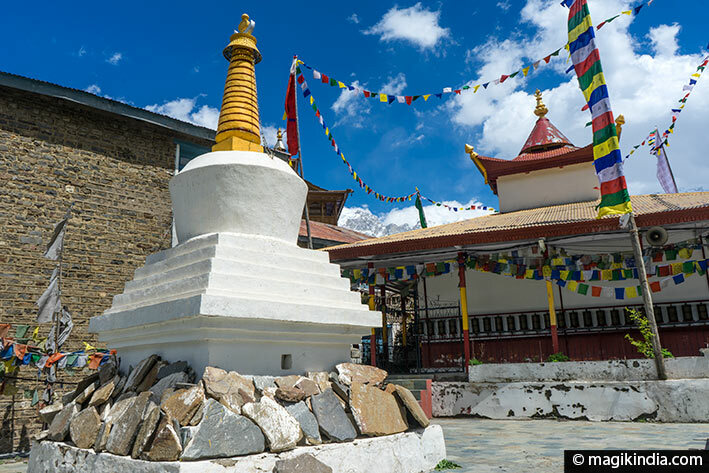 Foreigners wishing to travel to the areas close to Tibet’s border (Spiti, Poo, Khab, Sumdo, Dhankar, Tabo, Gompa, Kaza …) must obtain an Inner-line permit from the offices of Shimla, Manali, Kullu, Rampur, Kaza or Reckong Peo. 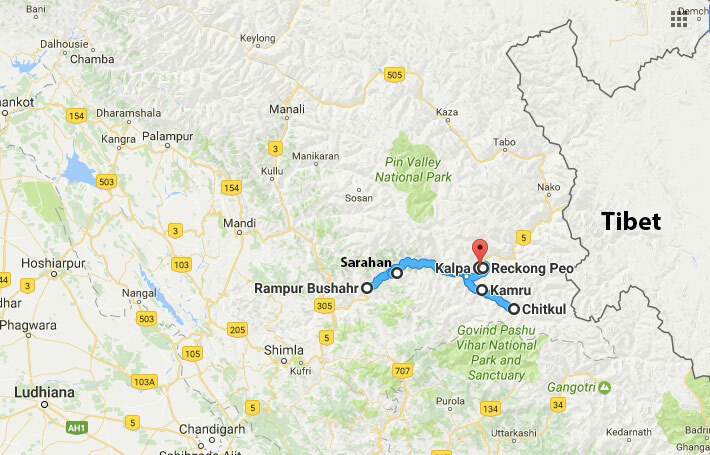 Our journey through Kinnaur begins in Rampur, located 140 km from Shimla, and setting on the banks of the Satluj River. It was once an important stop on the former Indo-Tibetan trade route. The city itself has little interest but its palace is certainly worth a visit. 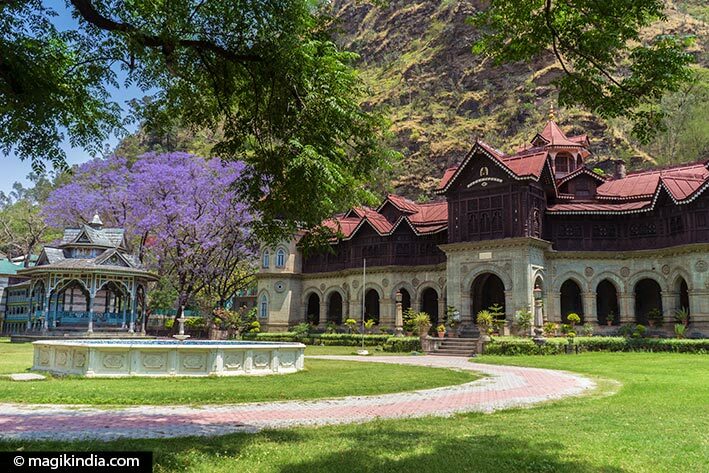 Rampur was once the seat of the princely state of Bushahr, which left us the elegant palace of Padma. 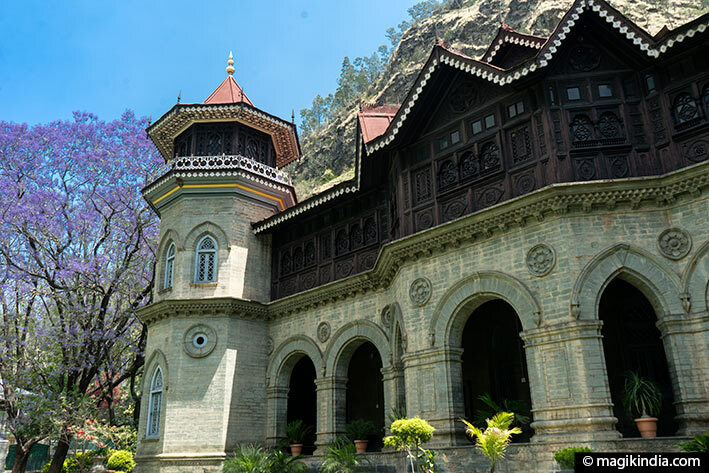 Built in 1917, during the reign of King Padam Dev Singh, it shows a harmonious Indo-European architecture; woodwork from Kinnaur and stained-glass windows from Belgium. 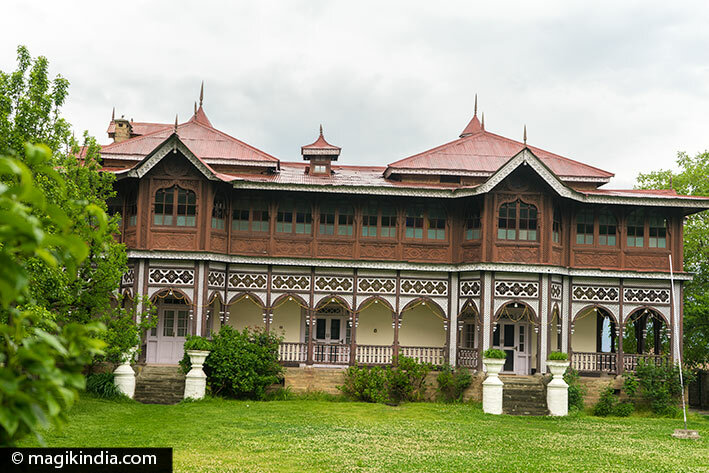 The Padam palace is currently the main residence of one of the heirs of the Bushahr royal family, Mr. Virbhadra Singh, chief minister of Himachal Pradesh. As it is a private property, it is not possible to visit the interiors but you can walk through the gardens all around the palace. Every year during the second week of November, rampur holds the Lavi fair, which is very popular all over Himachal. It lasts four days and proposes local handicrafts and folk programs that bring together local artists. Continuing our route to the east, 35 km from Rampur, we come accross the small village of Sarahan, which was once one of the capitals of the Bushahr kingdom. 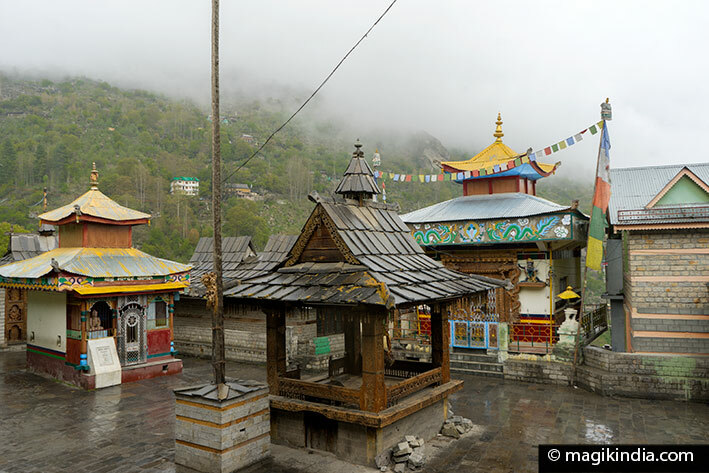 Sarahan boasts a monument of unparalleled beauty in whole Kinnaur: the temple of Bhimakali, dedicated to the Hindu goddess Bhimakali, the patron deity of the Bushahr royal family. The Bhimakali temple is one of the 51 Shakti Peethas, it is said that of the ears of Sati, the consort of god Shiva, fell here. The temple has two towers, one dating back to 1927 and the other recently rebuilt on the ruins of the former dating back to the 12th century. The latter hosts, on the very last floor, the silver statue of Bhimakali. 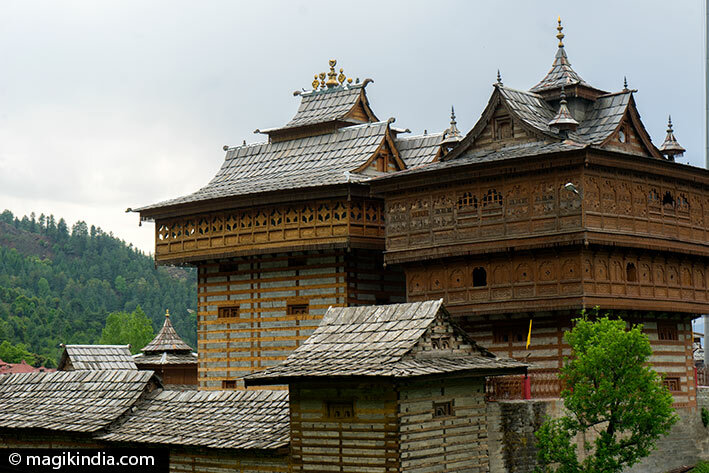 The towers have a typical kinnauri architecture with a pagoda roof and ornamental motifs finely carved into the wood. They are built with alternating stone and wood that is supposed to make it earthquake resistant. The kings of the Bushahr were also the priests of the temple and consequently resided in the sanctuary itself. In 1917, Raja Padam Singh built a palace a few hundred meters from the temple where he settled with his family. Nowadays, the current royal family visit Sarahan occasionally, at the main Hindu festivals like that of Durga Puja in sept-oct. The palace is not open to the public. 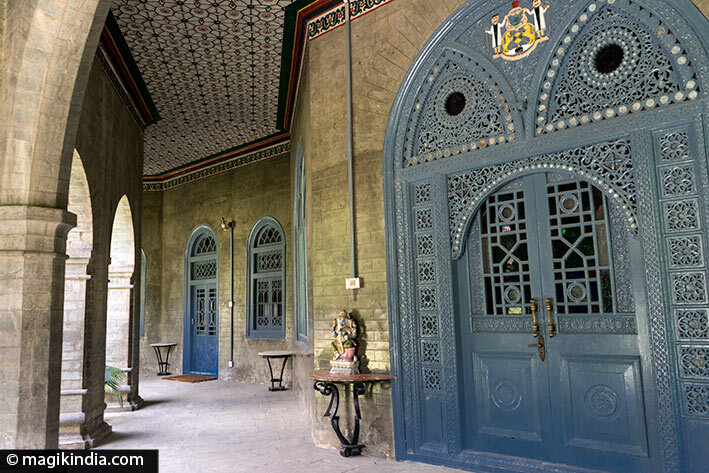 To appreciate even more the beauty and special atmosphere of the place, I advise travelers to spend a night in Sarahan and stay in the guest rooms of the Bhimakali temple. 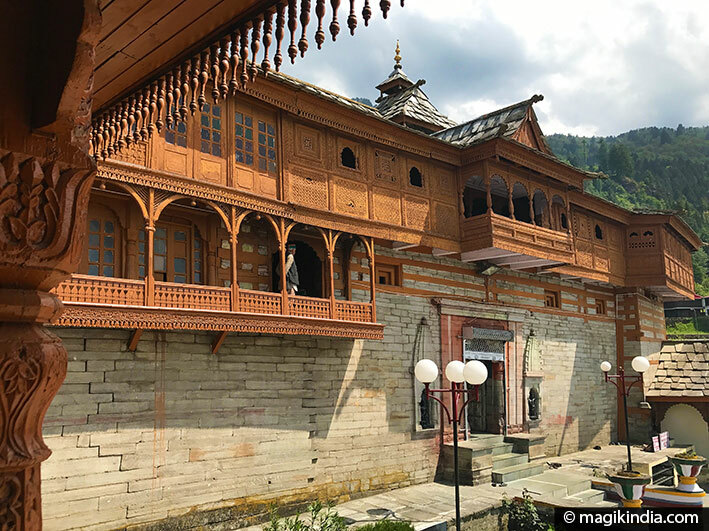 For 550 rupees per night, you will get a modest but spacious room with a view on the wooden-carved courtyard of the temple. The canteen of the temple offers simple but very tasty meals. 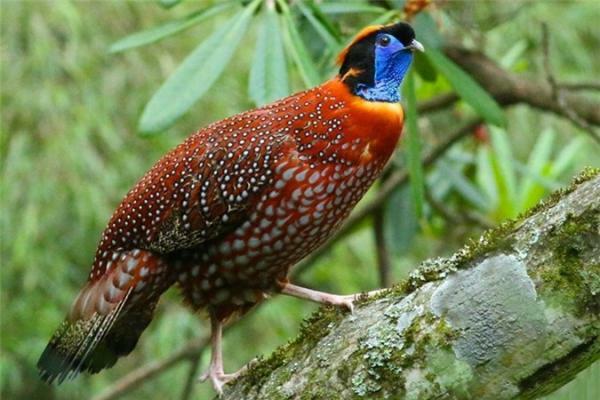 500 meters up the temple, one can visit a pheasant which hosts the king bird of Himachal, the Jujurana, or tragopan of Hastings (a small blue-throated pheasant) – one of the most protected species of Kinnaur. The pheasantry breeds also other local species of birds. It is closed during the summer (April-June), which corresponds to the breeding season. 100 km from Sarahan, still heading east, we enter the Sangla valley, famous for its gorgeous landscapes. The hamlet of Kamru, 2km from the village of Sangla, is one of those authentic villages that the traveler loves particurarly. Kamru was the capital of the Bushahr kingdom before it was shifted to Sarahan. 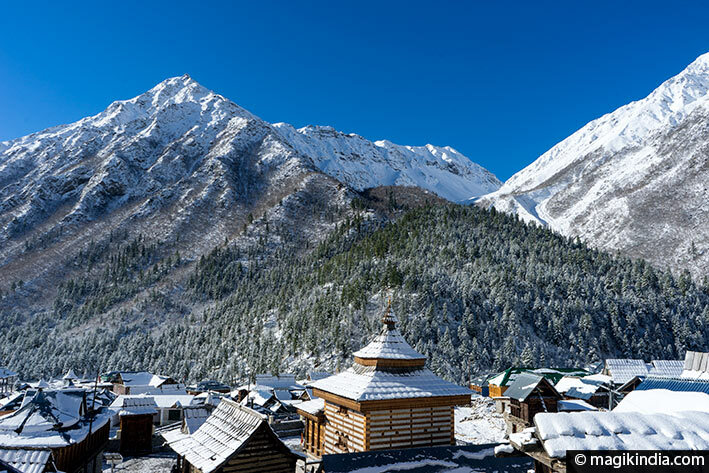 The village is built on a hill at 2600m above the sea. At its top stands a fort, one of the oldest in Himachal Pradesh. 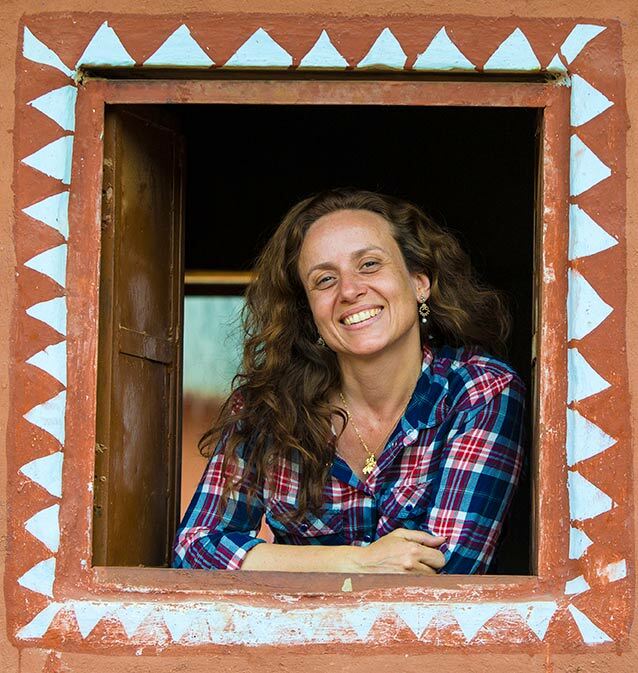 The fort is reached by a 20 min walk through a series of delicately carved wooden doors; As we climb we come across lovely traditional wooden houses. 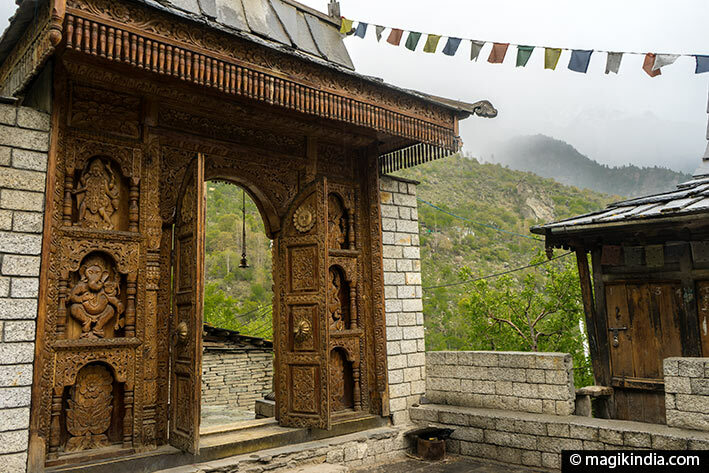 Just before entering the fort we find a group of Buddhist temples together with a Hindu temple in the same courtyard, another example of the peaceful coexistance of the two religions in the Kinnaur. We enter the complex of the temple-fort by a first door of solid wood and from there we are welcomed by two local ladies who will be our guides. First we have to remove all leather items, cover our head (men and women) and tie a scarf around our waist. 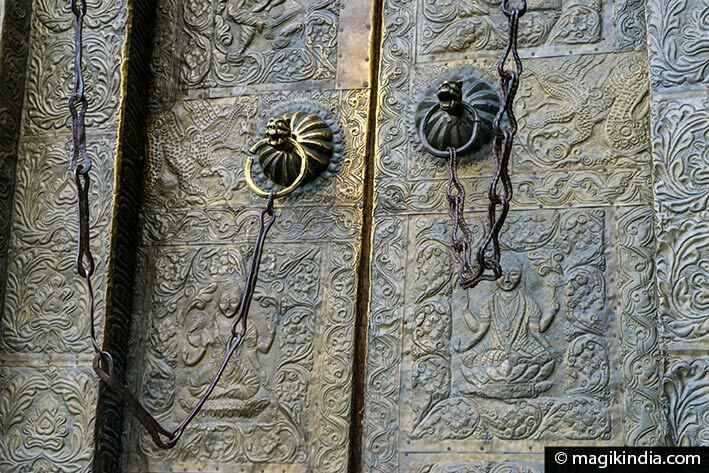 A carved brass door decorated with deities then opens onto a courtyard with a three-storey wooden tower (the fort) crowned by a pagoda-shaped roof. The idol of Kamakhya Devi, an avatar of the goddess Kali, is installed in this tower. It is said to have been brought from Guwahati (Assam), where the famous Shakti Peetha temple dedicated to this same goddess is located. 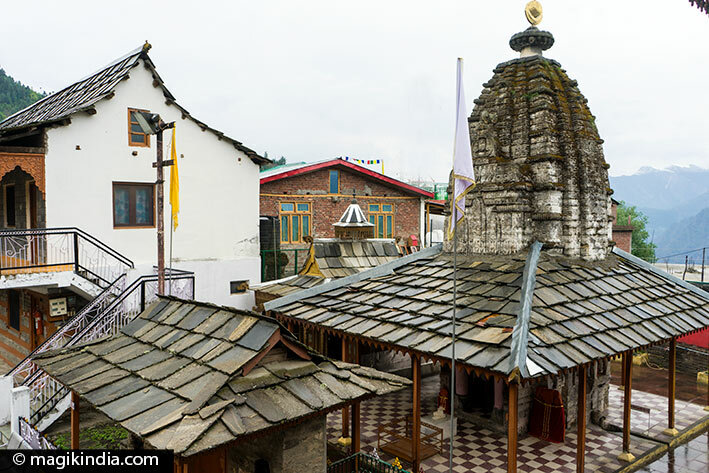 At the foot of the fort there is another 15th century temple dedicated to Badrinath where festivities take place every three years in honor of the deity (unless bad events occur that very year). During this feast, the idol of the temple is brought in procession to Gangotri, where the holy river Ganges takes its source. 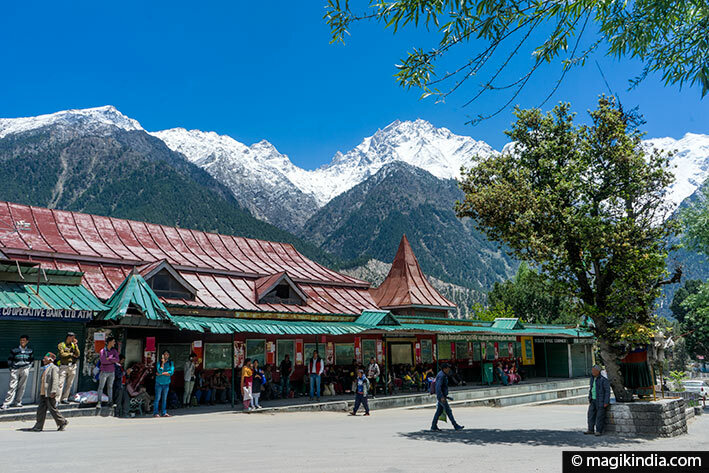 25 km from Sangla, we reach through winding roads, the picturesque hamlet of Chitkul; one of the stopping points on the Mount Kinner Kailash pilgrimage (see below). It is the last village before the Indo-Tibetan border. The road stops there. 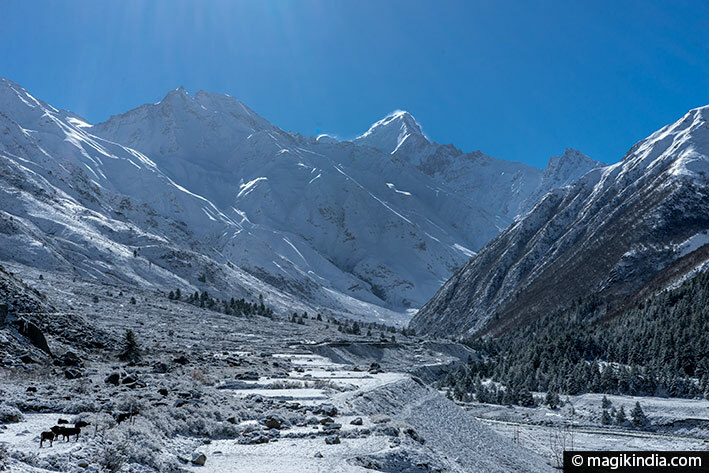 Chitkul is adorned with typical slate-roofs wooden houses and surrounded by magnificent snow-capped peaks where the river Baspa flowing in the village takes its source. 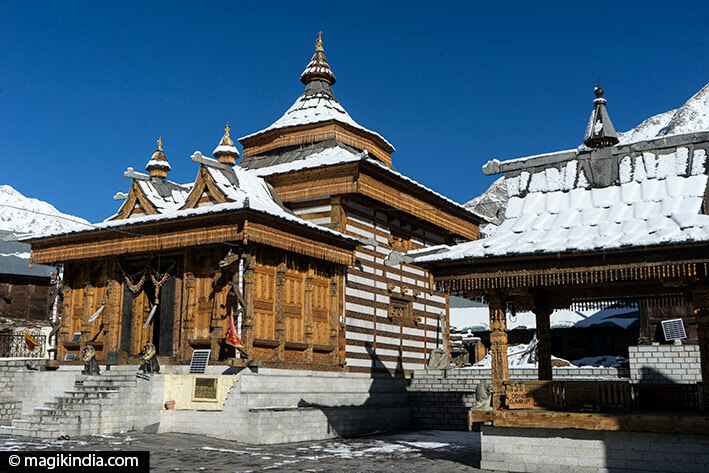 In the middle of the village stands proudly a stone and wooden temple that is said to be more than 500 years old. It is dedicated to the local deity, the goddess Mathi. The city dwellers of Delhi and Punjab particularly appreciate this exotic place and hotels are now springing up like mushrooms, unfortunately disfiguring this authentic place. The Kinnaur, Spiti and lahaul valleys are reputed for their breathtaking scenery and unforgettable treks. 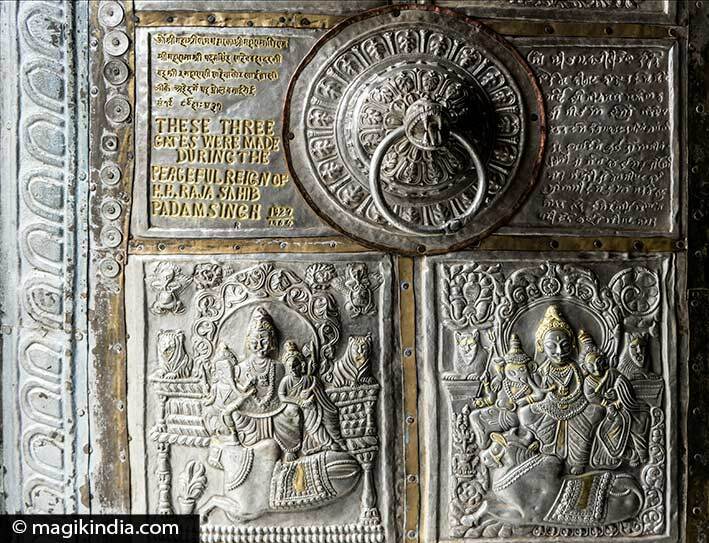 One of them is connected to Mount Kinner Kailash, the mythical residence of the Hindu god Shiva. This trek therefore has a very special spiritual significance; it is a ‘Parikrama’ (circumambulation) around the Mount Kinner Kailash, which begins in the village of Thangi then passes through the hamlets of Charang, Chitkul, Tabo, Losar and ends in Manali. The trek requires a very good physical condition. For foreigners, an “inner line permit” is required (see above). 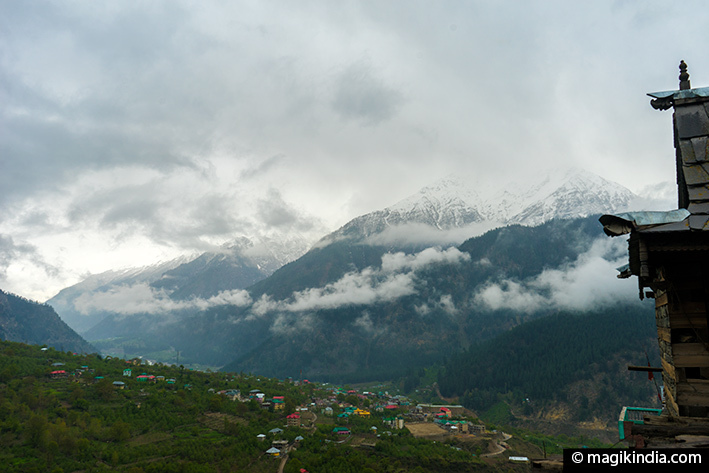 Reckong Peo is a busy and commercial city, administrative center of Kinnaur. Foreign visitors usually go there to do some shopping, take their bus and get their “inner-line permit”. 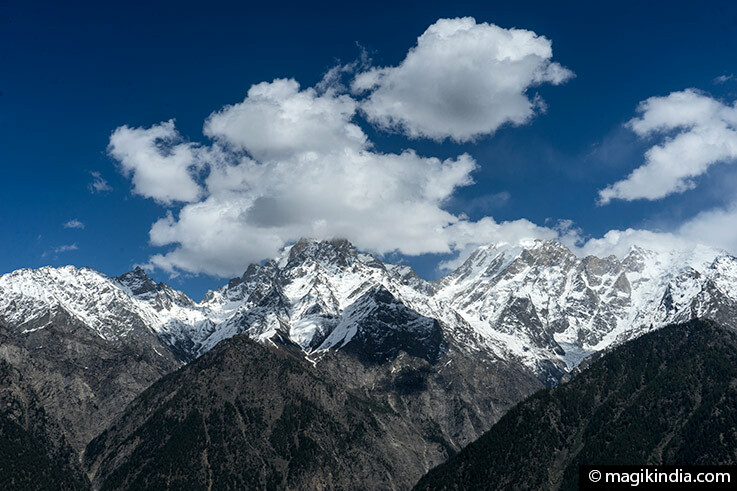 To experience the wilderness and breathe in the serenity of the mountains, we have to carry on our route to the village of Kalpa, 7 km from Reckong Peo. 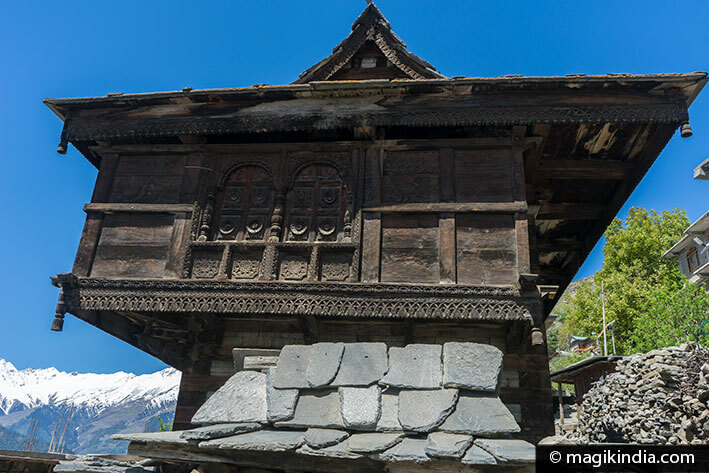 The charming hamlet of Kalpa offers an incredible panorama over the Himalayan mountains dominated by the famous Mount Kinner Kailash, culminating at 6050 m. Because it has a form of lingam, legend has it that it is one of the dwellings of Lord Shiva. 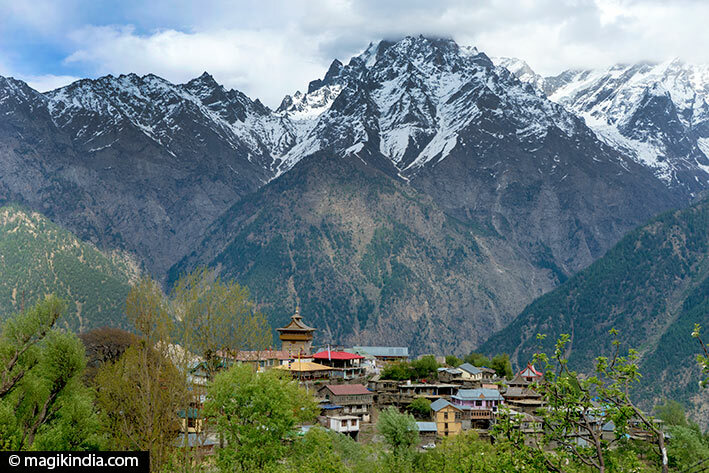 Kalpa is surrounded by apple tree fields, one of the major crops of the region, as well as cedars and pines that give the famous ‘chilghozas’. 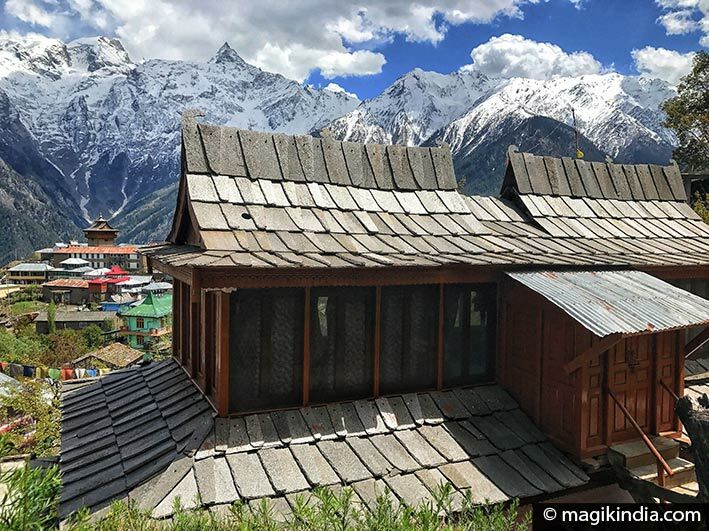 Besides the striking beauty of the surrounding mountain ranges, Kalpa includes a magnificent set of wooden carved temples (Narayan Nagini) as well as a tower (fort) at the top of the city rebuilt in 1959 after a fire. 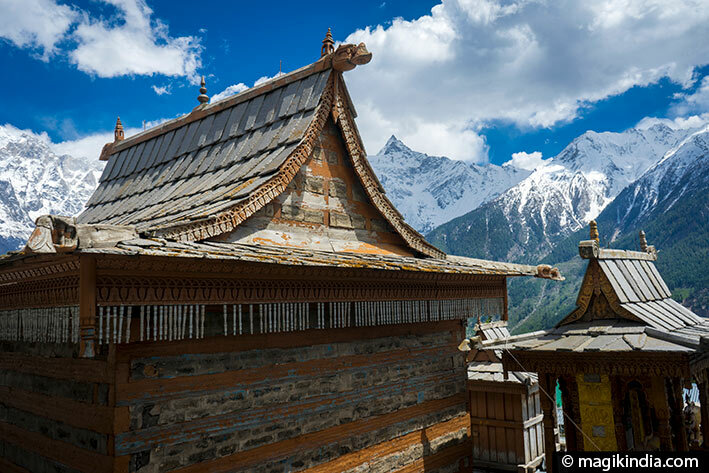 Proof again of the influence of Tibet, Kalpa also houses a Buddhist monastery (Hu-Bu-Lan-Kar gompa) attributed to the scholar Rinchen Zangpo (10th-11th centuries AD), who translated sanskrit texts into the Tibetan language. 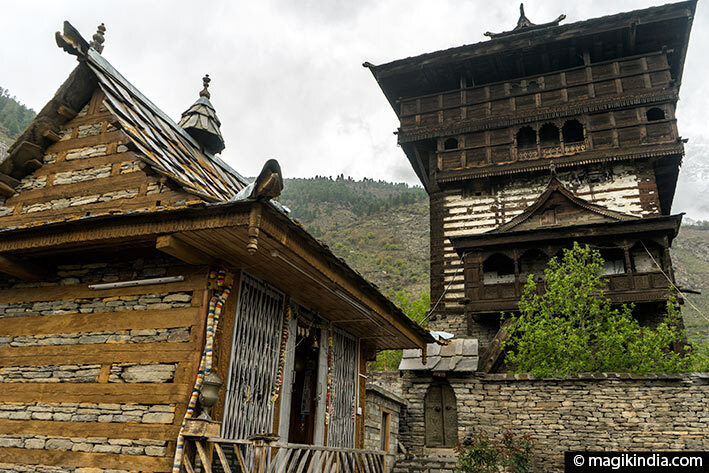 Several villages around Kalpa are worth a look, for their ‘kinnauri’ style; Roghi is one of those, 8km from Kalpa. Vertiginous roads lead us there with the Himalayan massifs as background. The small hamlet of a hundred souls offers the visitor a few nice wooden houses and a beautiful temple dedicated to Narayana. 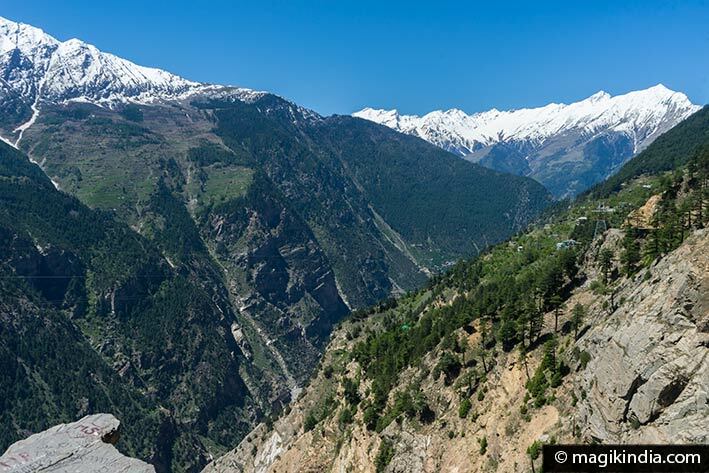 End of the journey … As you have seen it, the Kinnaur valley definitely have to be on your bucket list when in Himachal Pradesh!